Our WRB Analysis was designed by M.A. Perry (wrbtrader) in the 1980s as a teenager for a relative that was a floor trader. I publicly offered WRB Analysis Study Guide (basic tutorial chapters 1 - 3) in the 1990s to retail traders for free prior to it becoming fee-base...sold only 3 copies for $14 dollars. A few years later, after several upgrades of the WRB Analysis Study Guide and the development of the Advance WRB Analysis Tutorial Chapters 4 - 12...I decided to make the WRB Analysis Study Guide free again. Today, its now called the WRB Analysis Free Study Guide that contains basic tutorial chapters 1, 2 and 3. I have never used any other name titles for the WRB Analysis Study Guide (basic tutorial chapters 1 - 3). The WRB Analysis Free Study Guide is the foundation for the Advance WRB Analysis Tutorial Chapters 4 - 12...traders use the Basic tutorial chapters 1 - 3 to determine the merits of WRB Analysis prior to purchasing the Advance WRB Analysis Tutorial Chapters. The purpose for WRB Analysis is to give you the knowledge to improve your understanding of the price action you're trading prior to the appearance of your trade signals so that you can adapt in today's markets that changes every trading day...key changes in supply/demand and volatility that greatly impacts profit/loss results. Thus, WRB Analysis can help you to become more of an independent trader (e.g. day trader, swing trader, position trader, part-time trader, full-time trader). In terms of education...WRB Analysis is an education course about the analysis of the price action you're trading. It does not teach you how to trade (mentoring), it does not fix your discipline problems and its not a secret sauce. In fact, you can apply WRB Analysis to anything that has WRB intervals, WRB Hidden GAP intervals and WRB Zones. Merits of WRB Analysis can easily be measured by anyone that has a trade signal strategy that they've backtested and then compare those results to the backtest results of the same trade signal strategy merged with WRB Analysis. Next, the trader must do the same with their simulator results and then finally the same with real money (small position size only) trading results...comparing their trading without WRB Analysis versus their trading with WRB Analysis. Every year market conditions do in fact change...I'm constantly changing (adapting) the application of WRB Analysis due to changes in market conditions although the price action definitions for WRB intervals, WRB Hidden GAP intervals, WRB Zones remain the same. Therefore, don't sit around and do nothing if you're a struggling trader or your trading seems to have hit a wall or you need to make your trading less subjective (less intuition). Put some life into your trade signal strategy via merging it with WRB Analysis. This will allow you to take control and protect your financial security because world economies are changing every day and these changes do have an impact on your financial well being. Key Uses of WRB Analysis: Traders use key concepts from WRB Analysis to either improve the performance of their trade entry signal strategy, profit targets, stop/loss management, trend analysis or range analysis. 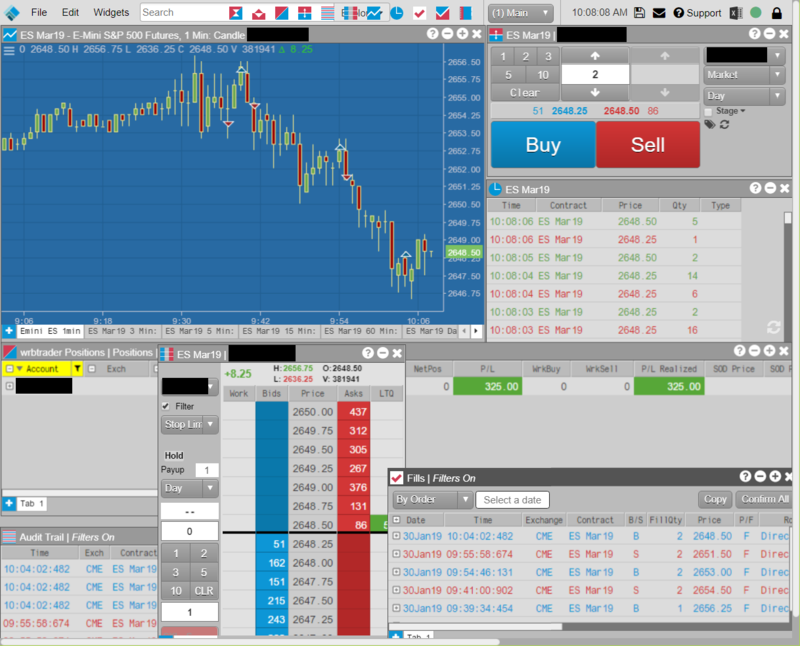 Also, the image (trade fills in broker trade execution platform and free chat room) above/left in this message post represents what many users in the private chat room were able to see via screen sharing...I took a quick screenshot while in screen sharing with other members for marketing purposes, for my own private trade journal documentation (other two monitors not shown for security reasons) and for verification that I traded on that specific trading day I posted real-time trades & WRB Analysis in the chat room for those that were not in the chat room or not allowed in the screen sharing for whatever reason with others that were allowed. WRB Analysis Free Study Guide is a trading course that's an introduction into understanding the price action you're trading...it does not teach how to trade. The prior version of October 5th 2012 had +6385 unique downloads before the upgrade to the current above version that now has +5,000 unique downloads...about 1/2 are now register users of TheStrategyLab. In addition, about 10% have purchased our Advance WRB Analysis Tutorial Chapters after they posted verification of knowledge, application of the WRB Analysis Free Study Guide via DOKs and images of timestamp trade fills in broker trade execution platform/broker statement. In contrast, another 10% have posted quantitative statistical analysis of the performance of their trade strategy without WRB Analysis versus the performance of their trade strategy with WRB Analysis. Simply, only about 20% of users that downloaded our WRB Analysis Free Study Guide have in fact verified their knowledge and/or application of WRB Analysis. You need a trade signal strategy to use with WRB Analysis. If you do not have your own trade signal strategy, we'll give you free access to one of our trade signal strategies that's already merged with WRB Analysis to give you ideas on how to create your own trade signal strategies merged with WRB Analysis. In contrast, if you do have your own trade signal strategy and you need help in merging WRB Analysis with your trade strategy...register/join our free support forum to get help with the merger of WRB Analysis with your trade strategies. Yet, if you prefer to purchase our fee-base trade strategies that gives you access to our advance trade methods...read the information @ http://www.thestrategylab.com/tsl/forum/viewforum.php?f=4 or contact us for more information/questions that's specific to your trading instrument. Alert: There are several fraud reseller websites selling the WRB Analysis Free Study Guide for a fee via names like Trading Manual, TheStrategyLab Price Action Trading (No Indicators), chapters in Forex Trading ebooks and other titles without our permission. Worst, a few of the fraud reseller websites are secretly affiliated with review websites. We hope you find success after you've merged the key concepts of WRB Analysis with your trade signal strategies to improve the performance results of your strategies. In fact, to help with your due diligence of WRB Analysis and to ensure that you as the trader has downloaded, read, understood the WRB Analysis Study Guide...you are required to post DOKs (demonstration of knowledge) along with posting images of timestamp trade fills in your broker trade execution platform that correlate to key concepts from the WRB Analysis Free Study Guide prior to purchase of the Advance WRB Analysis education resources or any other fee-base education content here at TheStrategyLab. The DOKs and the images of timestamp trade fills in broker trade execution platform do not need to be the same trading day. In fact, the DOKs should involve trading days prior to any simulator or real money trading days. Traders that purchase the Advance WRB Analysis education content without posting the DOKs & images of timestamp trade fills in broker trade execution platform that correlate with the key concepts from the WRB Analysis Free Study Guide...the trader is refunded or given the option to post the verification info within 21 trade day's after purchase to gain access to the education resources that they had purchased...no exceptions. Simply, acknowledging errors in your WRB Analysis without me seeing it first in your price action analysis via WRB Analysis is also part of the learning process and verification you're learning, understanding and appliying WRB Analysis. This pre-qualification policy prior to purchase is to ensure the trader has performed their due diligence that our WRB Analysis is suitable for your trading style, your trade strategies and to ensure that you understand that you will need to do the work to improve your trading. We've setup a private thread section here at the forum for you to post questions, DOKs, images of timestamp trade fills in your broker trade execution platform (simulator or real money) and quantitative statistical analysis of your trading via key concepts from the WRB Analysis Free Study Guide. If you choose not to purchase our Advance Tutorial Chapters...we sincerely hope the key concepts from the WRB Analysis free study guide do improve the performance results of your trade signal strategies. You're required to document your learning and application of WRB Analysis if you decide to use it...comparing your trading before you learned WRB Analysis versus your trading after you've learned WRB Analysis. That implies you document your backtesting including maintaining accurate information about the date, entries/exits (timestamp), stop/loss management, trail stop management, chart time frame, initial stop/loss placement via WRB Analysis, trailing stop management via WRB Analysis, type of WRB profit targets used, position size management and WRB Analysis reasons for each trade on a simulator and then the same when you traverse to real money trading. Yet, if you're just interested in the academics of WRB Analysis for doing a review...do it properly via using a professional trade journal software for your quantitative statistical analysis via simulator trading while using WRB Analysis in combo with your trade signal strategies. At the minimum you must maintain a digital documentation of your WRB Analysis in a spreadsheet or professional trade journal software (e.g. tradebench.com, edgewonk.com, tradervue.com, tradingdiarypro.com, stocktickr.com, journalsqrd.com, tradingdiary.pro, mxprofit.com, trademetria.com or any other program) because they can provide you with the quantitative statistical analysis of your trading. This will help you to self help your own trading and you'll be able to show facts about your trading regardless if you use WRB Analysis or some other analysis with your trading signal method. We can then setup a private thread for you here at the forum for you to post quantitative statistical analysis or your trading via WRB Analysis. If you can save charts to your documentation for each of your documented trading days...that's a big plus for me to help you with your trading and for yourself in self-help (preferred) if you have any kind'uv backtest results or quantitative statistical analysis of your trading regardless if you're on a simulator or real money trading. Trading is hard...don't beat around the bushes...do the work before you trade with real-money and then continue doing the work while trading with real-money to increase the odds for success. Those traders that do not document their trading...I'm sorry to inform you but we do not want you to use our free services nor use our fee-base services because you're not willing to do the work. Lets pretend you do not have a trade method to document and you're only in the learning phase of WRB Analysis. You must still document your learning and application of WRB Analysis. For example, you can document valid WRB Zones each trading day, chart time frame you're using, chart of the day, time of occurrence for the WRB Zones, identifying the type of WRB Zone from chapter 2, number of Up WRB Hidden GAP intervals versus number of Down WRB Hidden GAP intervals plus any other WRB Analysis information that you want to accumulate data for possible backtesting at a later day when you do develop a trade method. In addition, document how long you were learning each tutorial chapter and document what trade methods you're going to merge with WRB Analysis. Without this critical information about your learning and application of WRB Analysis, I can not provide you with good support because I will not be able to determine where you need help in your trading. Just as important, you will not be able to determine where you need help in your trading. Also, you will not be able traverse from documentation to backtesting and then into real money trading. In addition, when market conditions change, you'll need that documentation to help you to identify areas in your trading to adapt to the changed market environment of the price action you're trading to minimize drawdowns (consistent losses). 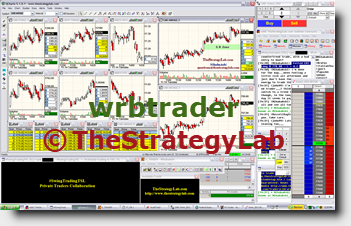 It's highly recommended that while you're learning WRB Analysis Tutorials, you use WRB Analysis with our free real-time ##TheStrategyLab chat room. The purpose of the free chat room is for you to ask questions and get real-time answers involving the price action you're trading and to improve your understanding of WRB Analysis along with documenting your experience with WRB Analysis along. Simply, if you do not follow our instructions after reading the free study guide, WRB Analysis may be confusing to you and may not be useful to your trading as you navigate markets that are always changing. Reminder, the WRB Analysis Free Study Guide is a trading course that's an introduction into understanding the price action you're trading...it does not teach how to trade. Specific Uses of WRB Analysis ? You may need to ask questions here at the forum about the below mentioned uses because it may be confusing to you how to merge WRB Analysis with your trade method. In fact, I can create a private thread for you to ask specific discussions about any of the below uses if you do not want other users to know about your trade method or you can post your questions here in the public area of the forum. Creating a private thread for you via request only and the private thread section of this forum is the most active area of the forum. In fact, use your private thread to post screenshots of timestamp trade fills in your broker trade execution platform of each day that you trade while you're learning WRB Analysis. Actually, you should be documenting your trading (simulator or real money) with screenshots of daily broker statements and daily quantitative statistical analysis even if you're not using WRB Analysis. This task only takes a few minutes each trading day and it's just a very good habit to get into instead of only viewing your trading account at your broker website. Each tutorial chapter contains objective rule-base price actions that will allow you to know exactly what is a WRB, WRB Hidden GAP, Key Market Events (KME), Swing Point, Strong Continuation, WRB Zone and WRB profit targets. You'll learn which particular WRB are suitable as a WRB Hidden GAP and then you'll learn which WRB Hidden GAP qualifies as a key change in supply/demand that allows the WRB Hidden GAP to traverse into a WRB Zone. It's during this learning process where you'll merge WRB Analysis into your trade signal strategies (e.g. supply/demand, support/resistance, confluence, gap, breakouts, fading breakouts, double top/bottom, divergence, Japanese Candlesticks, range, trend, intermarket analysis, VSA, gartley/butterfly, traditional chart patterns, trendlines, channels, price moving averages et cetera) to improve the performance of your strategies and to give you a stronger understanding of the price action you're trading prior to the appearance of any trade signals. Support (answering your trading questions) to this study guide is free and only provided to traders that join our TSL Support Forum and active members. The definition of active members is that they have either a private trade journal or private thread here @ TheStrategyLab in which they are documenting, journaling or asking questions related to WRB Analysis. The support (forum and/or chat room) is critical for you to learn how to use WRB Analysis to improve trade signal strategies from entry to exit via exploiting key changes in volatility. Therefore, it’s a time for you to take action and use our free support to exploit key changes in supply/demand of the price action you’re trading via WRB Analysis. You can use the resources below to properly determine the merits (usefulness) of WRB Analysis so that you’ll have your due diligence prior to purchasing any of our fee-base services. Today, users of WRB Analysis are using it to improve the performance of their trade signals (entry signal), profit targets (WRB pt levels, WRB Hidden GAP and WRB Zones), trade management (initial stop loss protection placement and trailing stop), trend analysis via the strong continuation price action definitions and range analysis via the swing point price action definitions. You can then compare the results of any aspect of your trade strategies (entry signals, stop/loss protection, trailing stops, profit targets or exit signals) that you see occurring within WRB Zones versus the results of your trade strategies that do not occur within WRB Zones. Yet, only do this after you’ve learned and understand basic tutorial chapters 1, 2 and 3. Yet, only use this strategy after you’ve learned and understand basic tutorial chapters 1, 2 and 3. Post a chart here at the TSL Support forum @ http://www.thestrategylab.com/tsl/forum/viewforum.php?f=61 or send the chart to us via email and I’ll annotate the chart with WRB Zones from advance tutorial chapters 4 – 12 that are still open for you to use in tomorrow’s price. You can then use the WRB Zones to look for trade opportunities via your trade signal strategy, use the WRB Zones as profit targets or use the WRB Zones for trade management. Therefore, there’s no hindsight analysis. There are several accolades at the above link that represent excerpts from articles posted at Futures Truth magazine and Stocks & Commodities magazine. We have no affiliation with these particular trader magazines or with any other online trader’s article nor have we given the researchers any financial compensation for the trading articles that gave us the status as one of the top performing chat rooms. Simply, our status as one of the top trader chat rooms is via our own merits as researched and documented by the authors at the noted magazines even though they stated in error that we are a trading room (as in signal calling trade alerts room). Simply, we do not allow copying/mimicking of members posted realtime trades. Its just a chat room for you to help document your own trading via WRB Analysis and to ask WRB Analysis related questions in realtime. Yet, regardless if you have your own trade strategies or need our help as you begin the process of designing your own methods…you will need to use the free 30 day support to fully exploit the WRB Analysis Tutorial Chapters study guides that’s offered at the TSL Support Forum. The free support begins whenever you post your first question at the forum. Next, you’ll be able to determine the merits of WRB Analysis to determine if you should purchase the advance tutorial chapters 4 – 12. With that said, the WRB Analysis Tutorial Chapters 1 - 3 file document is the only file you're allowed to share with other traders if they ask you questions about your trade method. Thus, our copyright protection policy only applies to the WRB Analysis Advance Tutorial Chapters 4 -12, trade signals strategies and resources (FVB, AJCTR, APAOR, STR and VTR). Also, your downloading of the word document file that's posted here at TSL Support Forum or anywhere else online via wrbtrader user name implies you understand it's the only file you can share whereas all other files you agree to not share our education material as described below in the copyright policy statement. Our WRB Analysis and Price Action Only Trade Signal Strategies are protected under The Digital Millennium Copyright Act and we aggressively pursue any violations or infringements of our copyright protection policy. Reality, this is more than just about copyright protection....its also about cybersecurity that we at TheStrategyLab take very seriously. Therefore, you yourself are not allowed to re-disseminate, re-distribute, repost any aspects of our price action only strategies, wrb analysis or any other resources of ours to file sharing, message boards, forums, blogs, websites, Youtube, Myspace, Facebook, Twitter, Stocktwits, news groups, emails, mail nor via any other social network communication source without the permission of TheStrategyLab.com regardless if you're a fee-base client or not. Most violators of our copyright protection are from India, Pakistan, China, Russia, Panama and Philippines via using services like GoDaddy.com, NameCheap.com, eNom.com, CloudFlare.com, Hawkhost.com, DomainsByProxy.com and any other information we find in the Whois info @ https://www.whois.com/whois/ or ICANN whois info @ https://whois.icann.org regardless if the violators are hiding their identity/websites behind private registrations. We concentrate our efforts on these particular countries and other countries not listed above after they attempt to market (resell) our education content in English around the world via the above listed website services that allow copyright protected material to be sold illegally through their business. Further, we contact the copyright infringement departments of social media services like Twitter, Stocktwits, Facebook, Pinterest, Google Plus and Youtube if the violator has an account with them for the purpose of reselling or sharing our education content without our permission. We easily identify the violators and then report them to Google, Bing and Yahoo search engines so that the caches of these violators are removed from the search engines. Further, all of our education content contains hidden codes to help us easily identify the specific person that's violating our copyright protection policy. You will be denied access to corrections, denied access to updates and new versions, denied access to the TSL Support forum itself, not allowed to purchase any other fee-base resource of TheStrategyLab.com (e.g. FVB advance trade signal strategies, Directional Creeper Movement (DCM) trade signal strategies, AJCTR trade signal strategies, APAOR trade signal strategies, STR trade signal strategies, VTR trade signal strategies, Advance WRB Tutorial Chapters) and not allowed access to the mentor/student list for in person mentoring. File Sharing, Forums, blogs, chat room or any other online location that continues to store the message posts or files after we've contacted them about the copyright protection violation will have the urls (links) to those messages removed from all major search engines cache (e.g. Google DMCA policy) upon notification to the search engines about the copyright protection violation. Simply, you're not anonymous. TheStrategyLab.com and a few trusted clients are members of most active trading forums around the world via different user names. We often use their help along with search engines to search for discussions or files involving concepts from our trade methodology. Therefore, it's not worth risking losing access to resources of TheStrategyLab.com because we often give members in good standing free access to bonus education material. Also, each client has a unique copy via an identifier code embedded within the strategies to make it very easy for us to determine which client or none client has been sharing our fee-base material without our permission...including bogus (fake) copies. Therefore, we'll seek legal counseling for possible legal action against the member and any forum, blog, chat room, website et cetera that continues to allow posting or file storage of our copyright protected education material after search engines have removed the urls (links) from their cache.